North Korea stepped up its anti-U.S. rhetoric on Monday, accusing Washington of mounting military pressure on the regime and vowing to respond to any pre-emptive U.S. attack with an "annihilating" nuclear strike. The threat of atomic retaliation was apparently linked to the heightened scrutiny of North Korea following reports by the United States and Japan that the reclusive state had taken steps to prepare for a test of a long-range missile. The North's Korean Central News Agency, citing an unidentified "analyst" with the state-run Rodong Sinmun newspaper, accused the United States of harassing Pyongyang with war exercises, a massive arms buildup and increased aerial espionage by basing new spy planes in South Korea. "The army and people of the DPRK are now in full preparedness to answer a pre-emptive attack with a relentless annihilating strike and a nuclear war with a mighty nuclear deterrent," the report said. The report concluded by urging the U.S. to "get out of South Korea promptly." About 29,500 U.S. troops are stationed in South Korea as a deterrent against the communist North. The threat of a nuclear retaliation to a U.S. strike was an intensification of the North's customary anti-U.S. vitriol, which often accused Washington of plotting an attack on the country. On Friday, Pyongyang accused the United States of driving the situation on the Korean Peninsula "to the brink of war," and said it is fully prepared to counter any U.S. aggression. Washington and Japan have said in recent weeks that spy satellite images show North Korea has taken steps to prepare a long-range Taepodong-2 missile for a test-launch. Last week, President Bush warned North Korea not to test-fire a long-range missile, saying Pyongyang must tell the world its intentions for any launch. "Launching the missile is unacceptable," Mr. Bush said in an East Room news conference alongside Japanese Prime Minister Junichiro Koizumi. Mr. Bush said that he and the Japanese leader discussed concerns about what is loaded onto the missile and where North Korea intends to aim it. He asked for "a full briefing" from the North Koreans about their intentions. "There have been no briefings as to what's on top of the missile. He hasn't told anybody where the missile's going," the president said in a reference to North Korean leader Kim Jong Il. "He has an obligation, it seems like to me and to the prime minister, that there be a full briefing to those of us who are concerned about this issue as to what his intentions are." Said Koizumi, through a translator: "Should they launch a missile, that will cause various — we would apply various pressures. ... I believe it is best that I do not discuss what specific pressures we were talking about." Mr. Bush said the situation with Pyongyang presents an opportunity to increase global cooperation on missile defense systems. Estimates for the range of the missile vary widely, but at least one U.S. study said it could be able to reach parts of the United States with a light payload. 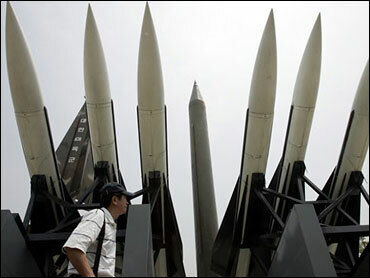 Speculation that Pyongyang could fire the missile has waned in recent days, however, since the country's top ally and a major source of its energy supplies, China, publicly suggested North Korea should not to go ahead with the test. The United States and its allies South Korea and Japan have taken quick steps over the past week to strengthen their missile defenses. Washington and Tokyo are working on a joint missile-defense shield, and South Korea is considering the purchase of American SM-2 defensive missiles for its destroyers. The U.S. and North Korea have been in a standoff over Pyongyang's nuclear weapons program since 2002. The North claims to have produced nuclear weapons, but that claim has not been publicly verified by outside analysts. While public information on North Korea's military capabilities is murky, experts doubt that the regime has managed to develop a nuclear warhead small enough to mount on its long-range missiles. Nonetheless, Lt. Gen. Michael Maples, director of the Defense Intelligence Agency, told U.S. lawmakers last week that officials took the potential launch reports seriously and were looking at the full range of capabilities possessed by North Korea.